Sarah, a nurse working in the Broderip ward, has a Shiatsu session. 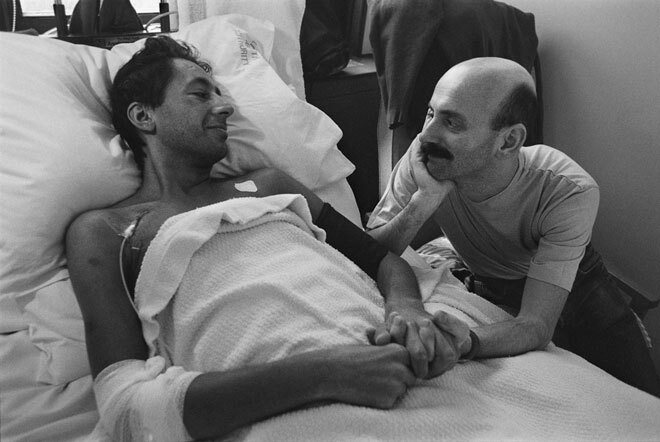 Shiatsu sessions were available free of charge for members of the team working in the AIDS wards, to help relieve some of the stress that resulted from working in this environment. 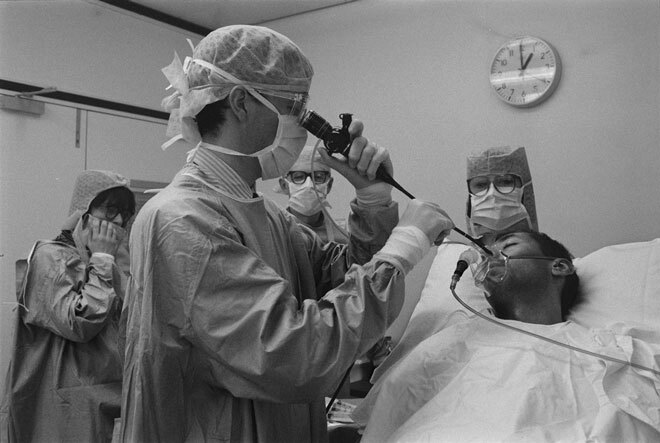 In 1993, I spent a number of weeks photographing the Broderip and Charles Bell wards in London’s Middlesex Hospital as part of the Positive Lives project. This was the era before antiretroviral medications had become available, a very distinct and tragic time. 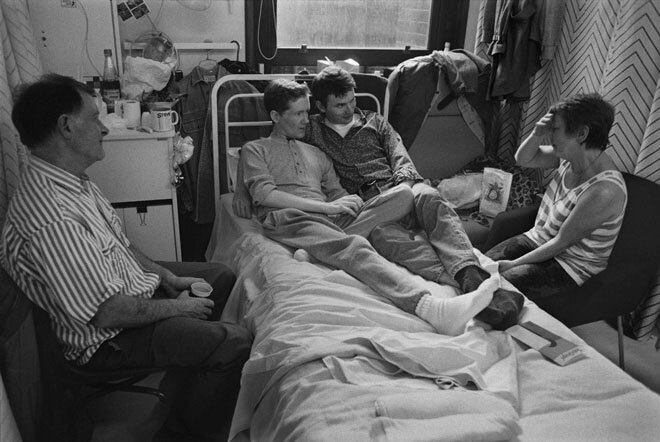 All of the patients on the wards, many of whom were young, gay men, were having to face the terrifying prospect of an early and painful death. 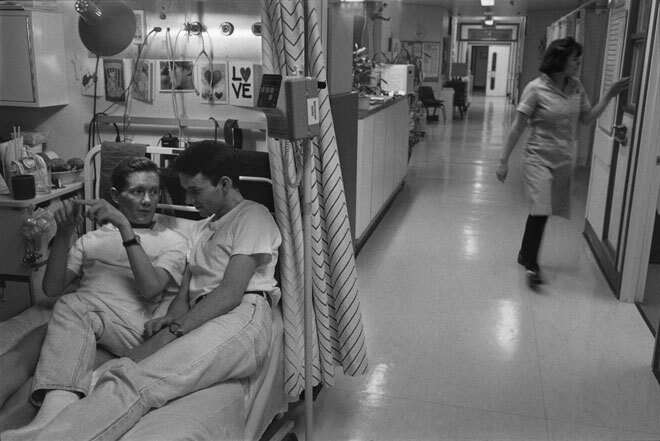 These were some of the few dedicated AIDS wards that existed in London, even more unusual for their decision to open themselves to being photographed. 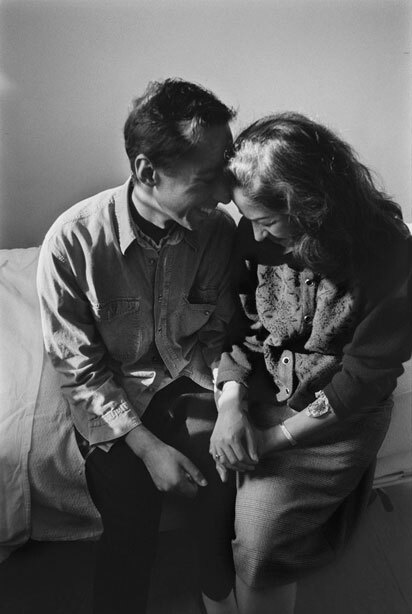 Considering the high levels of stigma and fear that existed at the time, the decision of these four patients to allow themselves, alongside their families, lovers and friends to be photographed was an act of considerable bravery. 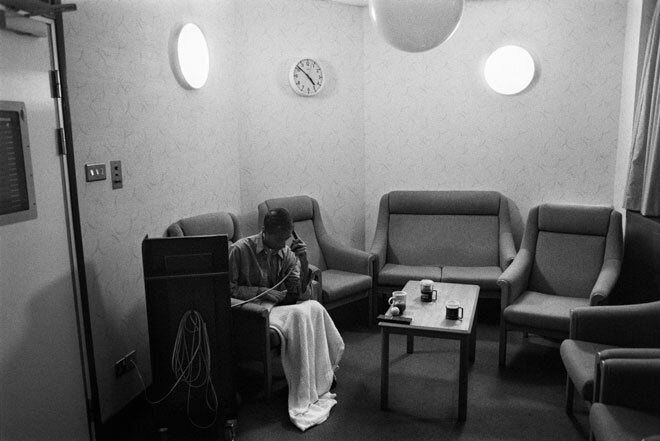 During my time at the hospital, I photographed their treatment and many other aspects of ward life, including the intimate way in which the staff, patients and their families related to one another. Treatment was not a passive process, but rather an active engagement on the part of the patients, who were often extremely knowledgeable about their condition. The staff, too, became far more attached to their patients than was commonplace in hospitals at the time. 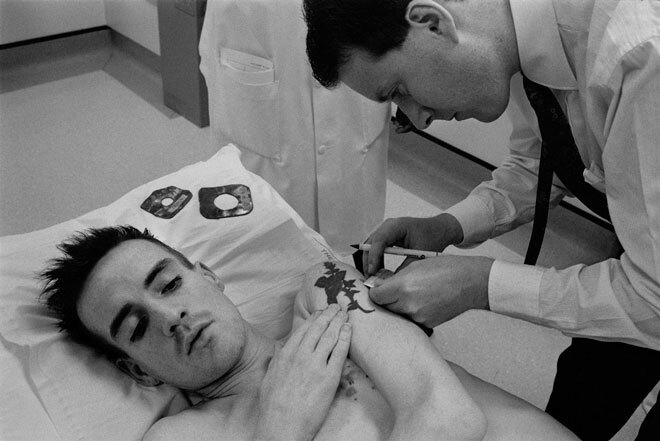 This was my first encounter with HIV/AIDS, one that greatly impacted the course of my life and subsequent photographic journey. While André was in the ward for a routine treatment, he suddenly became critically ill. With his mother alongside, he seemed to be about to die. André makes a phone call from the visitors’ room. Steven in the visitors’ room with a friend. Steven has a Kaposi’s sarcoma lesion on his arm monitored. This rare form of skin cancer is a common AIDS-defining disease. Steven plays with his niece in the visitors’ room. Steven embraces a friend who had come to visit him. Sarah, Steven’s nurse, visits him at home. 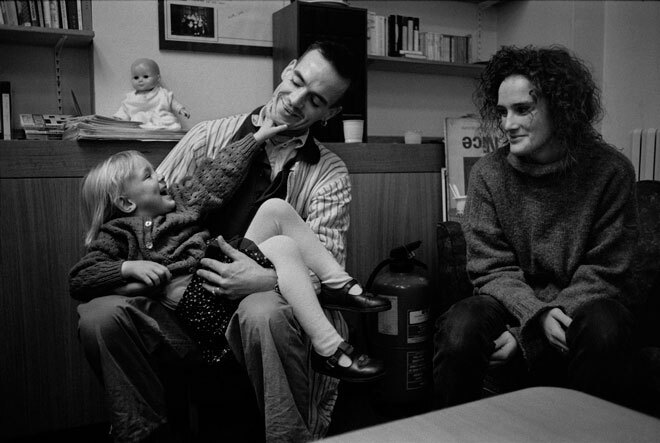 John spends time with his dedicated parents and devoted partner. 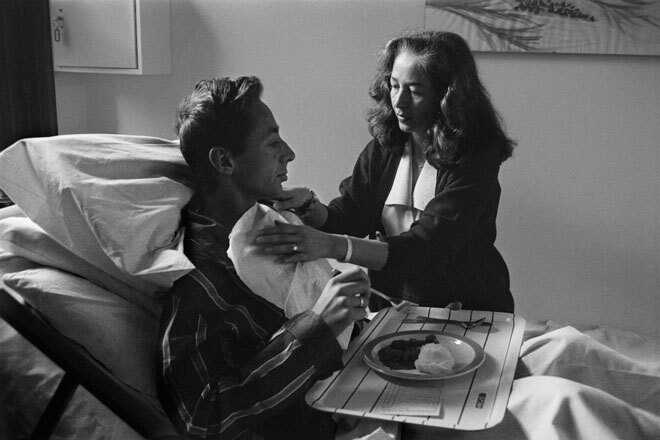 John and his partner kiss in the hospital bed. 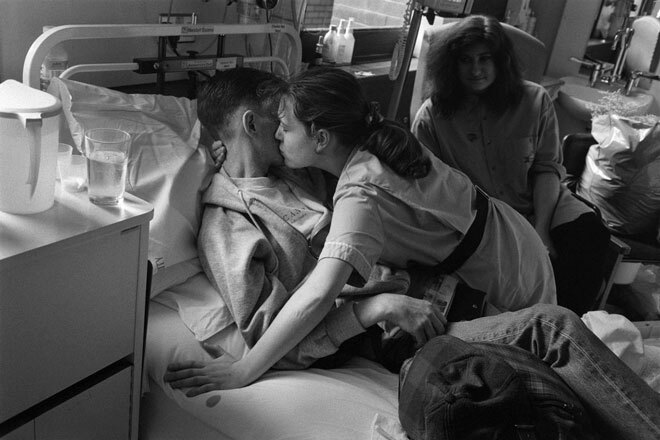 The acceptance of such intimacy was one of the more unusual aspects of this ward. 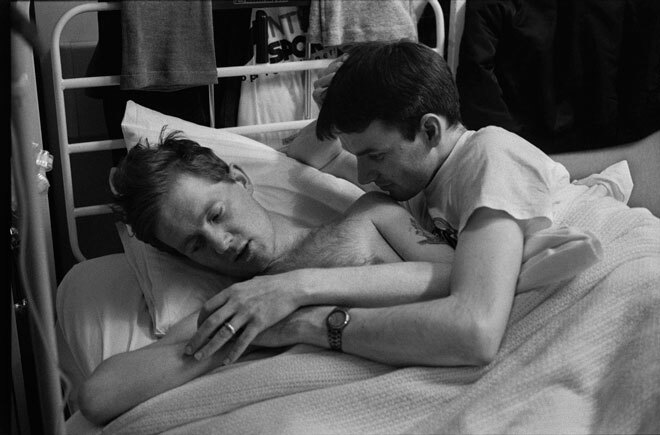 For John, his partner, parents and friends, the ward became almost a home. John in bed with his partner. His mother and partner would often sleep over at the hospital. 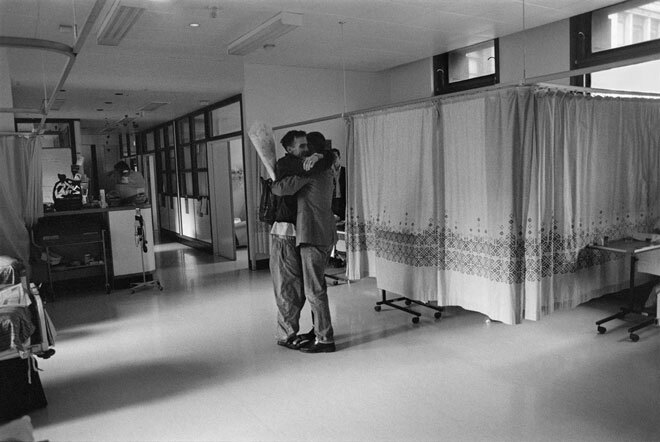 One of the ward nurses kisses John goodbye before he leaves for home. 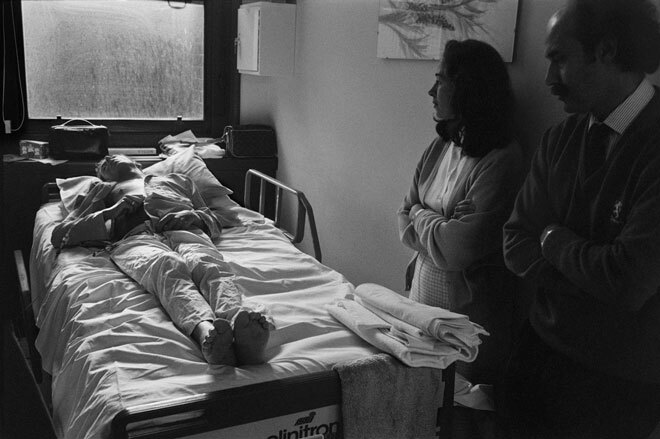 At this stage, he was coming in and out of the ward fairly frequently. 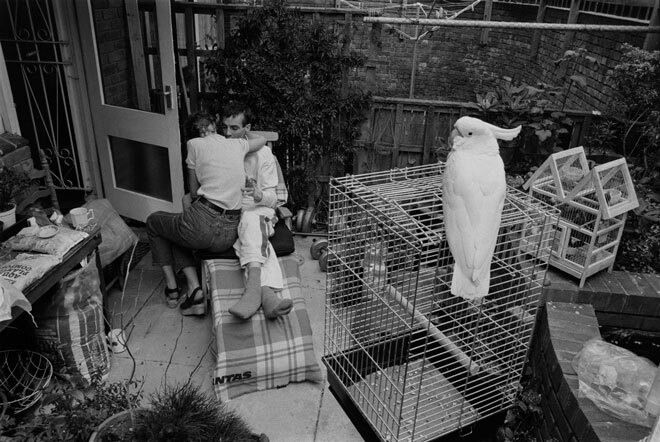 John and his partner, back at home.